Tail light : DiNotte 300R. 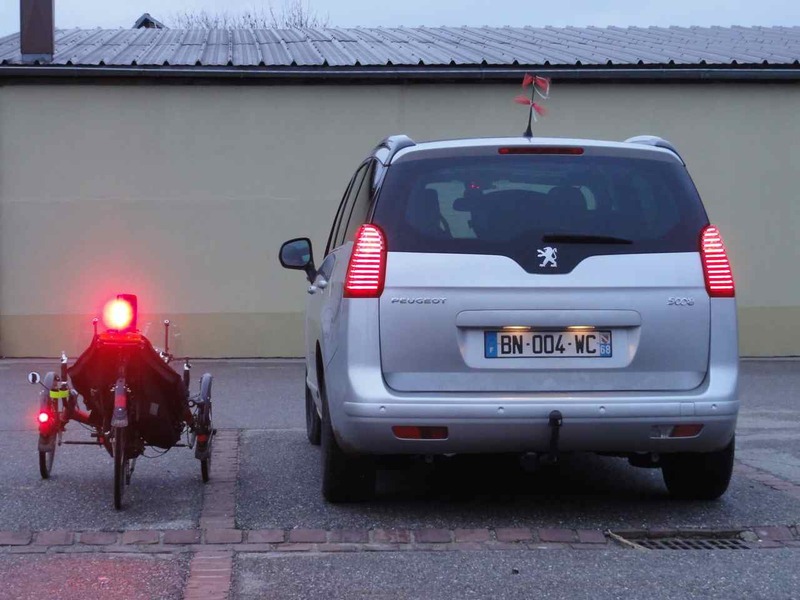 I used also to have a Lumicycle Tail Light One mounted as a back-up, but I took it away, as I never used it in more than a year. Why ? 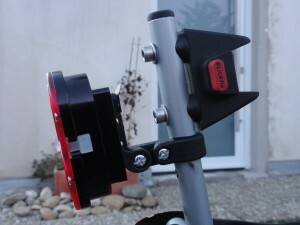 From the reviews I read on the web, the DiNotte looked as one of the best ones in term of luminosity, charged with USB (I can charge in on my computer at work if I discovered it was going down on my way). Pros : very bright, just perfect. A real light. Not just the Lumicycle One which would be far not enough. Cons : the little rubber piece that protects the USB-plug looks not very robust. Experience : mounted on the vertical bar of the Veltop. Just incline the 300R a bit down towards the road, to have it illuminating the road (and not the drivers !). 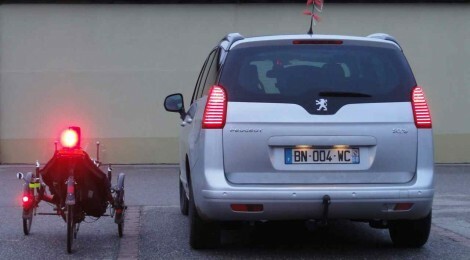 This way, you create a wide red flack on the road, and this is very well seen by the drivers in your back. 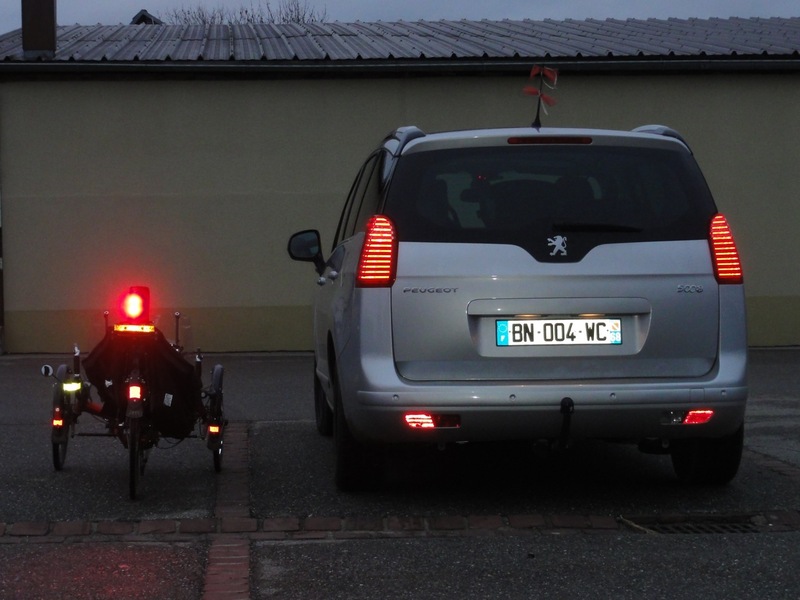 For the comparison, here with a Peugeot 5008, my rear light in “high” mode (the one I always use) and the side light flashing a burst – without a camera flash. 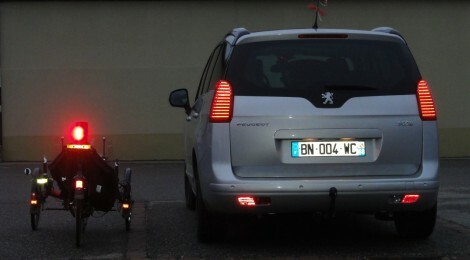 With a camera flash, this gives another idea of the brightness of the rear light, with the reflective material also showing up.